Yesterday, the Antfia podcast Hotwire had as its guests the anti-fascists Rebel Girl and Mel. Rebel Girl: Militant responses like the shutdown of Milo Yiannopolous’ talk at Berkeley have drawn heated criticism from liberals. Considering this weekend’s protests had a larger turnout with more liberal types, what was the dynamic between counter-protesters like? Mel: The dynamic was surprising. I think that there was a difference on Sunday in that folks who were not explicitly antifascist, as in black bloc, were actually really supportive of the black bloc and its tactic and the message to the fascists that “you are not welcome here, by any means necessary.” So there was a lot of support, which was really overwhelming and almost hard to believe. It felt really genuine. However, there was still a pretty significant presence of true liberals who hold up their “white silence is violence” cardboard signs but still hurl profanities at anyone dressed in black. Violence can be strategic, it can be a tactic, but I think the violence that is most concerning to me as a person of color is the violence that exists daily from groups like that, from people like that: the liberals in Berkeley who will do anything in the name of free speech but also continue to gentrify, and continue to call the cops on communities of color. 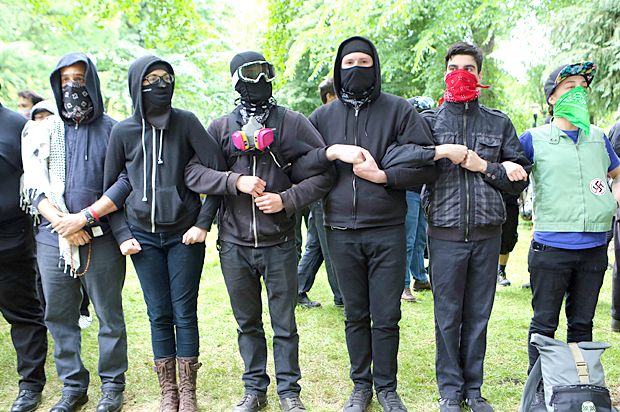 It is no wonder the mainstream left is ditching Antifa. "Liberals" (I still hate using that label) may complain about antifa's violence, but they have no problem taxing, regulating, and prohibiting all sorts of peaceful activities, caging those who disobey, and killing them if they resist. These crazed lefties keep using the word 'violence'. To quote the movie "Princess Bridge" - 'You keep using that word... I don't think it means what you think it means'.